Adnan, Amit, and I have completed our book "Elements of Programming Interviews" (EPI)! It is available for purchase from Amazon, Barnes & Noble, and CreateSpace. 11/26/2014: I will be a Visiting Professor at Department of Computer Science at National Tsing Hua University, and will offer a short course Art of Programming Interviews, which aims to help students learn about how to interview software engineer intern positions at top technology companies, this December! 11/10/2014: It has been a little more than two years since we publish Elements of Programming Interviews, and it is truly amazing to witness this book becomes the #1 Best Seller in Data Structure and Algorithms on Amazon. 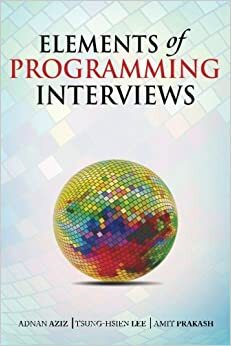 Moreover, Elements of Programming Interviews is now on a par with Introduction to Algorithms on Amazon, the best selling book in Computer Science! 10/30/2013: Elements of Programming Interviews finally cracked into Top 1000 books on Amazon! 05/06/2013: Elements of Programming Interviews reached #1 among books in Data Structures, #2 among books in Interviewing, and #3 among books in Software Development! Besides, we are approaching Top 1000 books on Amazon. Thanks for all your support! 02/18/2013: Elements of Programming Interviews is available at India right now. You can buy at Pothi and Flipkart. 02/14/2013: Elements of Programming Interviews reached #1 among books in Data Structures, #3 among books in Interviewing, and #3 among books in Software Development! 02/06/2013: Elements of Programming Interviews reached #1 among books in Data Structures, #3 among books in Interviewing, and #4 among books in Software Development! I am a Software Engineer at Google. Before that, I was a two-time Software Engineer Intern at Facebook and a graduate research assistant at Department of Computer Science, The University of Texas Austin. My research interests include design and analysis of applied algorithms, parallel and distributed computing, natural language processing, and CAD for VLSI synthesis. Designed and analyzed problems for Google Code Jam, one of the largest international programming competitions. Led and coordinated engineers for contest analysis. Hosted 2014 World Final at Los Angeles. Worked at Mobile Search Ads quality team where I improved the landing page quality for mobile platforms. Worked at Ads Infrastructure team which built the pipeline of feeding logs to world's largest distributed machine learning system. Member of Facebook Messenger team. Improved the Facebook Video Calling download instructions to increase engagement rate; the result eventually is adopted for the download instructions of all Facebook user-facing products. Built Facebook Messenger to provide seamlessly Facebook experience to every user on mobile and desktop. Member of Facebook Search team. Reduced the response time and improve the user experience when users using Facebook Search. Built Facebook Graph Search, the next generation of Facebook Search. An intuitive and convenient way of search information on Facebook. Designed training materials and organized practice contests for UT-Austin's representatives of ACM International Collegiate Programming Contest (ICPC). A voluntary service only for people with excellent performance in 2010 The University of Texas at Austin Fall Programming Contest. Our team got 2nd Place in the 2010 ACM ICPC South Central USA Regional Programming Contest. Designed problems and test data before the contest. Answered questions and coordinated with other judges during the contest. Announced contest results and explained correct answers after the contest. Test contestants' abilities of skills of logic, syntax, and structure. Defeat all participants including 2009 UT-Austin's representatives and ACM ICPC World Finalists. Two-year scholarship (USD 16,000 per year) granted by Ministry of Education, Taiwan. Outperformed 2nd Place router (NTUgr) by 203.6% under contest's metric. Two-Strait Tsinghua College Programming Contest is a programming contest between National Tsing Hua University in Taiwan and Tsinghua University in China; only elite students (the top 1%) students are selected to participate in this contest. Winners of this contest are topnotch students of National Tsing Hua University. Adnan Aziz, Tsung-Hsien Lee, and Amit Prakash, Elements of Programming Interviews: The Insiders' Guide, CreateSpace, Oct. 2012. Tsung-Hsien Lee and Ting-Chi Wang, "Congestion-Constrained Layer Assignment for Via Minimization in Global Routing," in IEEE Transaction on Computer-Aided Design of Integrated Circuits and Systems (TCAD), Vol. 27, No. 9, pp. 1643--1656, Sep. 2008. Keshav Pingali, Donald Nguyen, Milind Kulkarni, Martin Burtscher, M. Amber Hassaan, Rashid Kaleem, Tsung-Hsien Lee, Andrew Lenharth, Roman Manevich, Mario Mendez-Lojo, Dimitrios Prountzos, and Xin Sui, "The Tao of Parallelism in Algorithms," in Proceedings of ACM SIGPLAN Conference on Programming Language Design and Implementation (PLDI), pp. 12--25, San Jose, California, USA, Jun. 2011. Tsung-Hsien Lee, Yen-Jung Chang, and Ting-Chi Wang, "An Enhanced Global Router with Consideration of General Layer Directives," in Proceedings of ACM International Symposium on Physical Design (ISPD), pp. 53--60, Santa Barbara, California, USA, Mar. 2011. Tsung-Hsien Lee and Ting-Chi Wang, "Simultaneous Antenna Avoidance and Via Optimization in Layer Assignment for Multi-layer Global Routing," in Proceedings of IEEE/ACM International Conference on Computer-Aided Design (ICCAD), pp. 312--318, San Jose, California, USA, Nov. 2010. Yen-Jung Chang, Tsung-Hsien Lee, and Ting-Chi Wang, "GLADE: A Modern Global Router Considering Layer Directives," in Proceedings of IEEE/ACM International Conference on Computer-Aided Design (ICCAD), pp. 319--323, San Jose, California, USA, Nov. 2010. Tsung-Hsien Lee and Ting-Chi Wang, "Robust Layer Assignment for Via Optimization in Multi-layer Global Routing," in Proceedings of ACM International Symposium on Physical Design (ISPD), pp. 159--166, San Diego, California, USA, Apr. 2009. "how the Taiwanese beat both the U.S. and Europeans in the ISPD Global Routing Contest." "Taiwan schools are very strong in the CADathlon held at ICCAD each year. They win the placement and global routing contests at ISPD."